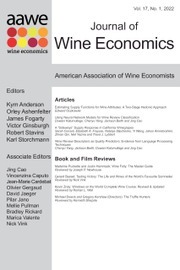 Journal of Wine Economics is the official publication of the American Association of Wine Economists (AAWE), a non-profit, educational organization dedicated to encouraging and communicating economic research and analyses and exchanging ideas in wine economics. The JWE provides a focused outlet for high-quality, peer-reviewed research on economic topics related to wine. The journal is open to any area related to the economic aspects of wine, viticulture, and oenology. It covers a wide array of topics, including, but not limited to: production, winery activities, marketing, consumption, as well as macroeconomic and legal topics. It is also open to research related to beer, spirits and food. The JWE is published three times a year and contains articles, short papers, notes and comments, field reports, reviews of books, films and wine events, as well as conference announcements. Why Do Distilleries Produce Multiple Ages of Whisky? Enter discount code KYMANDERSON2017 at the checkout to obtain your discount.